I’ve done quite a bit of holiday hosting in my life, and even when it’s a relatively small gathering, it’s still a lot of work. I always want to put my best foot (and best food) forward, but I’ve learned that it’s equally important to remain calm and relaxed when hosting a holiday meal. When the host or hostess is completely stressed out, nobody has any fun! The key to hosting a fun and stress-free holiday meal is planning ahead. The biggest mistake I used to make when it came to holiday hosting was over-focusing on the food and under-focusing on the planning. Since I love to cook, I would spend a lot of time studying recipes, creating my menu, and making sure I had all of the right ingredients, but I’d forget about the other important aspects of planning a big meal. 1. Schedule your make-ahead dishes. Everyone loves to make things ahead, but you have to be strategic about when and how you plan your make-ahead dishes. I like to make one dish several days ahead of time (perhaps a side dish or dessert that’s freezer-friendly), make one or two things the day before the meal, and then space the remaining tasks throughout the day of the holiday meal so that there’s only one dish I need to focus on right before dinner is served. One of my favorite things to make ahead is mashed potatoes. I used to wait until the last minute to make my potatoes so that they could be served piping hot, but it was stressful trying to perfect my potatoes while also worrying about the main course and other side dishes. Now I make my potatoes at least an hour or two before dinner-time, and use my slow cooker to keep them warm. They come out perfectly fluffy, hot, and delicious every time. 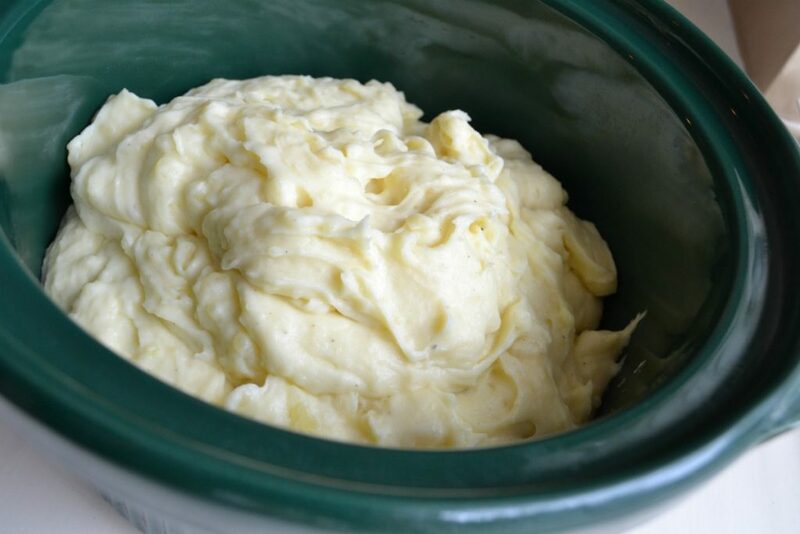 Click here for my make-ahead mashed potato recipe. 2. Take inventory of the pots, pans, burner space, oven space, and serving dishes you’ll need. I can’t tell you how many times I found myself hunting for my large sauté pan on the day of a holiday meal only to realize it was already in use. Sometimes I’d discover that two things needed to be in the oven at the exact same time, but at different temperatures. Or, I’d get ready to serve my lovely mashed potatoes and find that my sole remaining serving dish was an old, ugly chipped bowl. Before you finalize your menu, take into account the cookware and serveware you’ll need so that you can buy or borrow anything you’re lacking. 3. Create an hourly schedule for the day you’re cooking. On the day before your event, write out a full hour-by-hour schedule of what needs to be done when so that your day is evenly paced. When does the turkey or roast go in the oven? What time do you want to start chopping your brussels sprouts? How long will you need to warm your dinner rolls or bake your sweet potatoes? 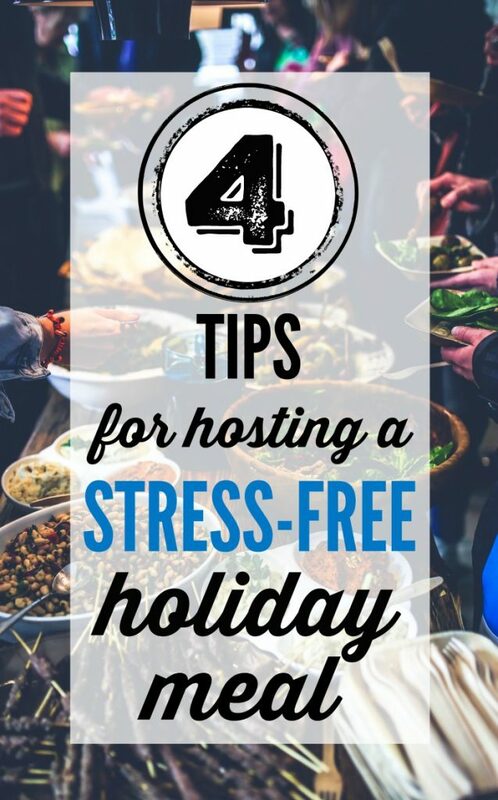 This will ensure everything flows smoothly on the day of your holiday meal, and you’ll wake up knowing exactly what you need to do instead of feeling stressed and disorganized. 4. Don’t be afraid to go pre-made. The #1 source of stress when it comes to hosting a holiday meal is trying to do too much. 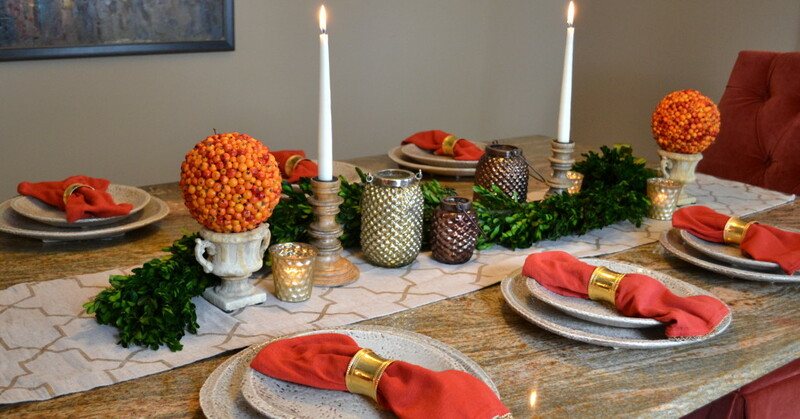 No holiday host or hostess can be expected to create a fantastic appetizer display, roast a turkey, make three side dishes from scratch, bake a pie, clean and decorate the house, and remain sane. Focus on a few things that you feel you can manageably handle, and either outsource the other dishes to guests, or pick up some pre-made things that only require opening and re-plating or re-heating. Most grocery stores offer a variety of high quality pre-made appetizers, side dishes, and desserts that are really delicious, and will give you one less thing to worry about on the day of your meal. Or, check out local restaurants for inexpensive take-out or catering items.